Joseph Cloidt survived the Civil War battles of Bull Run and Gettysburg, serving at one point as bodyguard to President Abraham Lincoln. Today, the final resting place of these quiet heroes is falling into ruin. 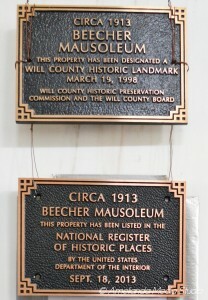 The Beecher Mausoleum, about 40 miles south of downtown Chicago, was named a national landmark in September, despite its eroding Bedford limestone veneer, its sepulchers desecrated by vandalism and neglect. The century-old site is listed by preservationists as one of the most threatened historic places in Illinois because of the complicated management and ownership laws governing many of these aboveground tombs that dot the state. The great-granddaughter of one of the Beecher Mausoleum founders is now struggling to restore the monument to preserve its local lore as well as the memory of the 173 veterans and civilians in its crypts. And she’s working with state preservationists to help other mausoleums in disrepair across Illinois. HARRISBURG – SUNSET MAUSOLEUMBodies have already been removed at the crumbling Sunset Lawn Mausoleum in Harrisburg in southern Illinois and the all-but-abandoned Fernwood Mausoleum in Roodhouse, southwest of Springfield. Previous owners of American Mausoleum in Peoria filed for bankruptcy and left the structure damaged and leaking five years ago, until the county state’s attorney’s office took over control and made repairs. When Thielman was a little girl, her family each Sunday would pay their respects at the Beecher Mausoleum where her grandfather, mother and other relatives were laid to rest. She returned as an adult in the mid-1990s to find the hallowed grounds of her ancestors turned into a local teen party spot. The gleaming marble floors were covered with empty beer bottles and scorch marks from bonfires. Vandals had torn off marble headstones. Initials and drawings were scraped into the front doors. Bullet holes patterned the exterior wall, presumably from rifle target practice. The mausoleum was once the pride of the town. “The building will be so constructed that it will be nondestructible and will be everlasting,” boasted the Beecher Herald in 1913, with later stories recounting the arrival of stained glass windows and completion of the marble setting. Five hundred people attended the June 1914 dedication ceremony just outside the village for the 100-by-50-foot building, co-founded by local real estate speculator Henry Thielman. It was one of hundreds of community mausoleums popping up across the country in the early 20th century. They were called grand “houses of the dead,” likened to the pyramids of Egypt, the Taj Mahal and the Mausoleum of Halicarnassus, one of the Seven Wonders of the Ancient World. “The community mausoleum gives for our dead what our hearts crave for them, the symbol and promise at least of eternity,” reads a company brochure from Cecil E. Bryan, famed architect of the Beecher Mausoleum and some 80 others in Illinois and throughout the U.S. The buildings featured a newly patented ventilation system that kept the site sanitary and odorless. The deceased would remain protected from soil and worms, rain and snow. The community mausoleum was designed to promote a more egalitarian eternity. In ancient cultures, only the wealthy were preserved in opulent aboveground tombs, with paupers and commoners resigned to anonymity in mass graves. The newfangled mausoleum was affordable to the masses. At Beecher, the $200 or $300 crypt subscription was cheaper than many cemetery plots. School chiefs, town mayors and military leaders lay alongside humble farmers, common folk and a patient from the Kankakee mental hospital. Most cemeteries and some mausoleums are owned by corporations, government agencies or religious institutions. But Beecher and many other community mausoleums of the time were run by a board of trustees, with a small per-crypt fee designed to cover long-term building maintenance. These pools of money eventually dried up. The board governing the mausoleum would fall apart after the last trustee was laid to rest inside, leaving the privately owned structures in a legal purgatory of sorts. Don Bahlman, of Virginia Beach, Va., had traveled a few times to visit that little building tucked away on a private gravel road in the middle of the Illinois countryside. The father he never knew was inside. Donald Bahlman, a World War II veteran, had died of cancer when his wife was pregnant with his namesake son. The younger Bahlman was deeply hurt that his father’s mausoleum had been vandalized. “That, to me, was like a personal violation,” he said. About two years ago, he contacted Thielman, through her website, beechermausoleum.org., she’d spent nearly two decades fixing up the site and collecting historical records of the departed, traveling some 100 miles from her McHenry County home. Thielman put together a new board to govern the mausoleum, and Bahlman, an architect, joined. Thielman now knows the names and stories of many buried there. A toddler died of an accidental gunshot wound. A woman took her own life and in the suicide note requested burial in the mausoleum for privacy from gawkers. And Bahlman even learned a family secret: His grandfather, a pillar of a local church, had been busted by federal agents during Prohibition for making whiskey in the basement. The Ten Most Endangered Historic Places of 2013 photo page.res.200The Beecher Mausoleum was named to the National Register of Historic Places on Sept. 18. This came just months after it was declared one of the Ten Most Endangered Historic Places by Landmarks Illinois, which also included the failing Fernwood Mausoleum downstate. Thielman said restoring the mausoleum will cost tens of thousands of dollars but didn’t have a specific estimate, saying it might vary based on volunteer labor. Bonnie McDonald, president of Landmarks Illinois, plans to begin surveying damage at mausoleums across the state. She and Thielman hope to bring legislation before the General Assembly next year requiring that state or local government care for these aging burial sites. They say restoration would be cheaper than removing and burying bodies if a mausoleum falls apart. Community mausoleums have been razed in Waukegan, Rockford, Decatur and other Illinois cities, according to Thielman. 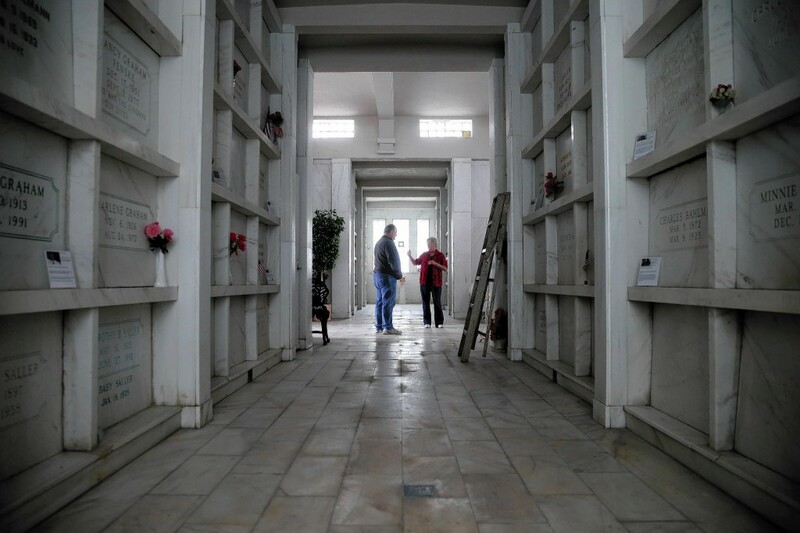 To Thielman, saving the Beecher Mausoleum is tantamount to preserving her own eternity.